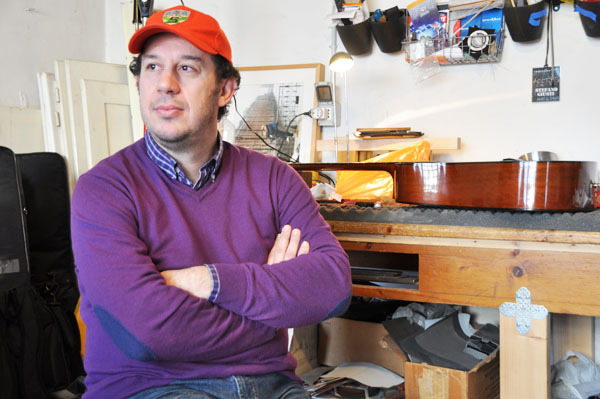 I walked into Stefano Giusti‘s workshop in his parents’ garage in the industrial outskirts of Prato with my first question all ready: How does one become a luthier? But in my head I was saying “dude, where the hell are the lutes?” The instantly likeable 43 year old, wearing a fashionable purple merino wool sweater with a less fashionable red wool baseball hat, must have guessed what I was thinking, for he right away explained the origin and evolution of the term “luthier” (liutaio in Italian, I love that word). “The term ‘luthier’ came about in the 14th century, when people played lutes, and luthiers made (and fixed) the instrument. As lutes fell out of favour and people started playing more violins, violas, and the like, the luthier’s business evolved towards these new instruments.” Stefano indicates a twelve-stringed guitar propped up against the wall: “the first guitars had five pairs of strings because they were a variation of the lute,” which, he explained, has a variable number of strings, most often eight. Now you’d be hard pressed to find someone who plays the lute (or Renaissance music), and the luthier in the literal sense of the term is a rare figure serving a niche market. 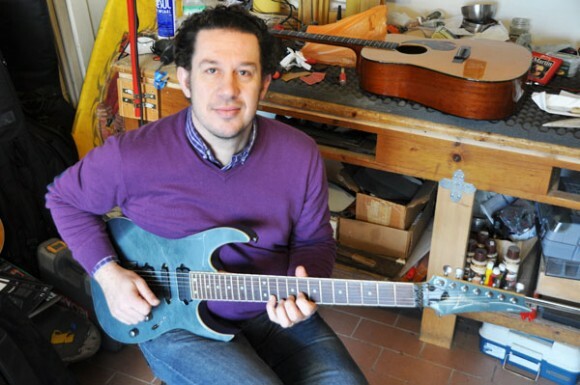 Stefano defines himself as a modern luthier – his business card says “Liuteria Moderna” and is illustrated with a psychedelic pattern of electric guitars. The more we talk, the more I figure out that his approach to his profession, and the way he got into it, is both modern and pragmatic, and has nothing of the romance that we normally associate with Italian ‘artisans‘ – a term I doubt he’d use to define himself. Stefano did not apprentice to a master luthier at the age of 16, as I’d imagined, nor does he pontificate about perfect harmonics. He does not feel a connection to the Florentine tradition of artisans nor to the Pratese tradition of making tangible products. 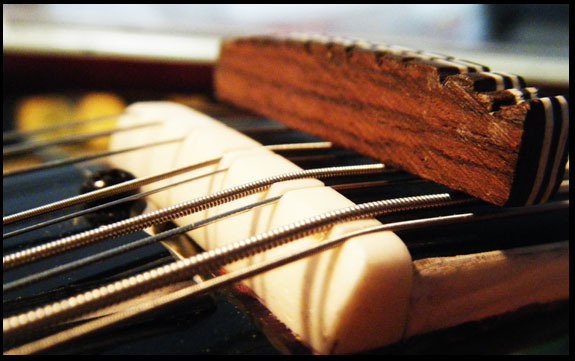 “Ci vuole manualità,” he says – it takes manual ability to do this job, and from the way he speaks of it, working on guitars is pretty simple stuff. Although there is one professional school in Cremona that offers an intensive instrument-maker program, there is little specific training available to luthiers. Stefano came to it pretty much by chance. 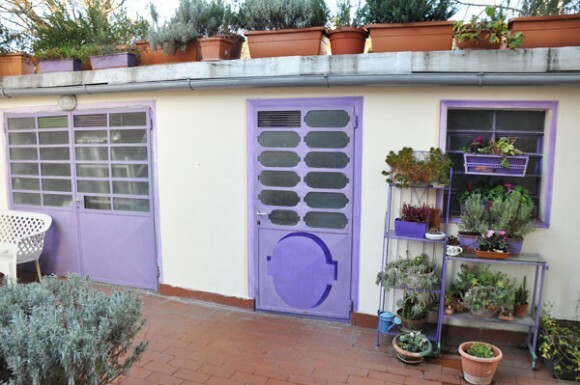 He had been living in the USA for a decade with his American wife and two kids when they decided to make the move back to Italy in 2006, and a friend offered him a job fixing guitars in a workshop in Florence (he’s since branched out on his own). Before this, Stefano worked in home improvement. His main contact with guitars was playing them: he started at the age of 13, was in a few amateur bands, but stopped when he took up the job of luthier. Sad, no? Not to him: “This work is more satisfying, less ephemeral, than making music,” Stefano says. We get back to my initial question of how one becomes a luthier, and by this time I’ve pretty much figured it out. Like many in this field, Stefano is self taught. “It’s pretty simple. You take apart an instrument, you think about how the parts fit together, their properties, how they work, and you put it back together… Ci vuole manualità.” As if being good with one’s hands is all it takes. Talking with him, you understand that he knows his stuff, he understands good work and good sound, but he won’t bore a non guitar-head like me with the details. The bread and butter of Stefano’s job is fixing guitars. 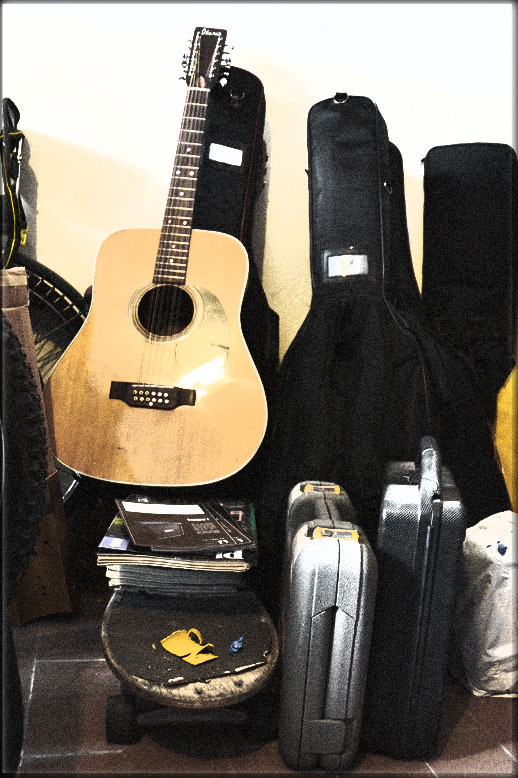 I look around the workshop and see about half a dozen guitars in various states of disrepair, amongst skateboards, fishing and knife hobbyist magazines, packs of guitar strings, shells for mother of pearl inlay and deer antlers. Work comes in waves – now, January, is a busy time, as was earlier last year when a client’s wife threw his collection of thirteen basses out the window (guess she’d had enough of that riff from “smoke on the water”). He shows me a few examples of repair jobs and explains the importance of balancing time and cost with functional needs and the cost of the instrument to start. In each case he’ll discuss with the client what needs to be done, and might offer more or less economical solutions. 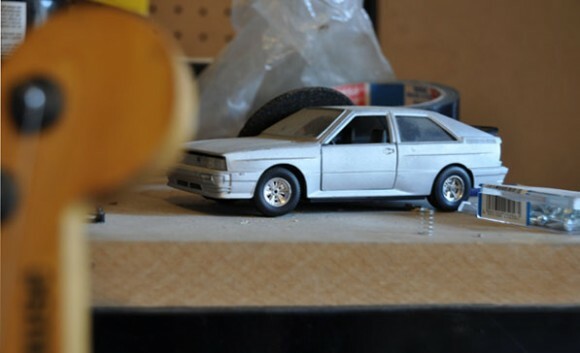 In the case of a break or crack, sometimes the best solution is a simple repair rather than aiming for a perfect aesthetic result which would require stripping and refinishing. This is especially true now that the finishes on guitars are a shiny, almost plastic shell. Does Stefano make custom guitars? He could, but he rarely makes guitars from scratch. It’s just not economical, he explains: for every person who dreams of building the perfect custom guitar, there’s a detractor who says it has no resale value. The fact is that the cost of a handmade guitar, even by the most famous of makers (like Sadowsky Guitars in New York), doesn’t go much beyond 4000 dollars. Working alone, it might take 2-3 months to build a guitar, and it’d be hard to survive on the proceeds. As I said, Stefano’s approach is pragmatic. It makes more economic sense to customize and fix guitars than to build them. Is there a future in this business? Do kids still take acoustic guitar lessons? Yes and no. There are always professional musicians and amateur guitar lovers, and there are still kids who take music lessons. Instruments will always be involved in accidents, and Stefano can help with that. But he has no trouble applying his skills transversally: as he moved from construction to guitar repair, he just as easily could be crafting anything else. He showed me a beautifully smooth knife that he was inspired to make with some leftover stainless steel that he recuperated from a friend’s business: the patient shaping and planing of the handmade knife uses the same skills as planing the body of a guitar. Stefano is a maker. The kind of person who produces tangible objects that are the past of our economy, but also its future. Makers are a new trend (not that Stefano is trying to be trendy), a kind of backlash in a historic moment overly based on intangible monetary exchanges and service industries (including people like me who make a living writing blogs), rather than on manufacture. Long live those with manual ability and the patience to carry it out! Bring your broken guitars and your customization dreams to Stefano Giusti in Prato, tel +39 3348921598, email stevostevo68@gmail.com.